The 'ethical bank' tries to go back to its roots, by casting off unsuitable business partners including payday lenders and tax dodgers. In an effort to put its wild, crystal meth-fuelled party days behind it, the Co-op Bank announced today that it had made its ethical code more stringent. Indeed, to show just how completely it’s turned over a new leaf, the ‘ethical bank’ will no longer trade with firms that fail to meet its own, high standards. And high they are. Under the bank’s revised code, it seems nothing more sinful than a second ginger nut with your tea will be permitted. The Co-op Bank’s renewed commitment to the environment, social and economic development, and human and animal rights means it has now blacklisted firms involved with ‘irresponsible gambling’ and payday loans, or that ‘do not responsibly pay tax in their home countries’. Co-op Bank may find the trek back to the moral high ground a rather long one. Though it has a strong history of ethical banking, – its code dates back to 1992 – its reputation was shattered in 2013 when it was found to have a £1.5bn black hole in its accounts, while its chairman, Reverend Paul ‘Crystal Methodist’ Flowers, was embroiled in a drug scandal that later resulted in a conviction. 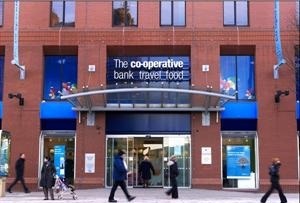 The bank was bought out by hedge fund investors and is now only 20% owned by the Co-operative Group. Its new management has pushed for some time to restore the bank’s reputation, launching an advert featuring an ‘ethics and values’ tattoo last year, and commissioning the YouGov poll that resulted in today’s change to their code. Four-fifths of the 74,000 customers polled said that they wanted the bank to stop trading with companies that breach its own ethical principles, and the bank is keen show it’s listened. ‘We have already written co-operative values and ethics into our constitution to ensure that this vital aspect of our heritage is maintained,’ said Laura Cartensen, chair of the Bank’s Values and Ethics Committee. While it’s all well and good that the Co-Op Bank is setting itself on the straight and narrow ethically, its customers might also be interested in the bank’s commitment to its own solvency. Last year, it lost £76m and then failed the government’s stress test in December. Still, one step at a time, eh.